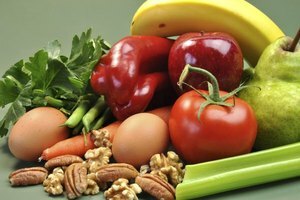 A dietitian studies the effects of food on the body. 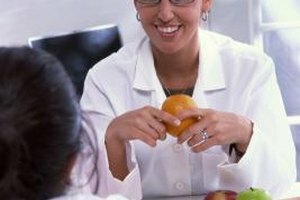 A major in nutrition or dietetics provides students with an education for careers as counselors, food inspectors or dietitians. Students in a nutrition program can expect courses on how the body uses food, and how exercise, aging and pregnancy change food intake needs; most programs also require classes in science, such as anatomy and microbiology. Several schools throughout the U.S. offer two- and four-year nutrition programs, many of which can be tailored to specific areas of interest. Students included in the University of Pittsburgh’s department of nutrition can choose from two distinct programs, both related to the world of dietetics. A Bachelor of Science in athletic training will provide graduates with the ability to educate others on prevention, recognition, treatment and the rehabilitation of athletes. Graduates can pursue careers in sports medicine, assisting physically active individuals on diet and nutrition. A bachelor’s degree in clinical dietetics and nutrition provides students with clinical experience as well as class work. Curriculum is largely math and science-based, training students on the proper use of food, as well as the effects of overeating and exercise on the body. Students interested in the program should complete three years of high school level math, chemistry and biology; although not necessary for admission, it is helpful for the transition into the program. Freshman students are also encouraged to get involved in the Student Dietetic Association of the University of Pittsburgh prior to enrollment. The university's program was ranked No. 1 in dietetics and clinical nutrition services by U.S. News & World Report in 2010. Ranked No. 2 in 2010 by U.S. News & World report, Purdue University’s nutrition program specializes in age-related diseases and diet and is emerging as a leading cancer research institution. The program has focuses in separate areas, including nutrition science for pre-med students or foods and nutrition in business for potential administrators, among others. Students combine lecture with lab and research to learn ideals of health, wellness and improving the quality of life for patients. The program is heavy in science and includes required credits in biology, biochemistry and physiology. Graduates will receive a Bachelor of Science degree in their chosen field, opening up career paths as dietitians, administrators and other specialties. University of Delaware students spend their first two years studying theory, science and math, while the final semesters are spent in lab and performing clinical duties. Students are trained on the importance of a healthy lifestyle and good food choices on health and life quality. The program, which was ranked No. 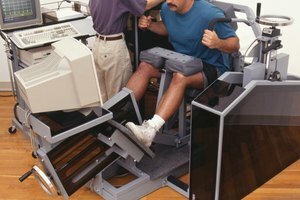 3 by U.S. News & World Report in 2010, focuses on topics like obesity, diabetes and cardiovascular disease, how to prevent these issues and runs research on how best to control and treat such illnesses. Students must complete degree-specific courses in math and science in addition to the required general education credits of the university. Two main programs serve the needs of future nutrition professionals. The dietetics program is fully accredited by the American Dietetics Association and requires a fifth-year internship and prepares students to take the national board examination. A focus in nutritional science is based primarily in science, preparing students for entry into a physical therapy or medical program. Additionally, students can proceed onto graduate studies in nutrition. John, Sara. "The Best Colleges for Nutrition." Synonym, https://classroom.synonym.com/nutrition-colleges-6532575.html. Accessed 18 April 2019.